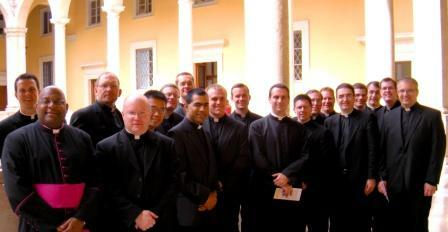 Kevin Hurley submitted this photo, taken by Father Eric Nielsen on June 19, 2010, after the Rome Experience seminarians and faculty met with Fr. Steven Lopes at the Congregation for the Doctrine of the Faith. The Prefect of the CDF is Archbishop William Levada, appointed in 2005 to succeeed Joseph Cardinal Ratzinger — now the Holy Father — who held the position until he was elected pope. As Prefect of the CDF, Levada acts as the principal defender of teachings of the Church. Father Lopes, the archbishop’s secretary, is holding a white paper in the front row. Rome Experience seminarians attend Wednesday audience: see video! Or was it 15,000? Let’s just say the place was packed! Today we had the Mass for the end of the Year of the Priest and it was an amazing sight! There were about 15,000 priests concelebrating with the pope, and thousands of other people besides – when the priests walked out after vesting, it took about an hour and a half for them to completely get out and fill up all of the seats and they arrived in very steady streams down the paths in St. Peter’s Square. Again, the homily was in Italian, so we couldn’t understand everything that was said, but there were some good responses from those who could, so I’m excited about reading the homily when I get a chance. The only thing that was a little disappointing about the Mass was the number of people who randomly walked in and out of the section we were in. I think that more than a few of them thought that it was just a tourist attraction to watch the Catholics perform their rituals. I’m glad that they were able to stumble in and at least in a small way participate in the Mass – but it was surely heartbreaking to watch them in their ignorance. After the Mass the pope drove right by where we were standing again and we were able to see him up close again, which was pretty neat. After the Mass we went for lunch at Santa Croce and then I went for an afternoon siesta (sometimes the Italians have great ideas!). After dinner we had a bit of a party for Fr. Heisler who was, unfortunately, leaving us to go back to the States to attend a conference for seminarian formators. It was a good time though – and a lot of good conversation. 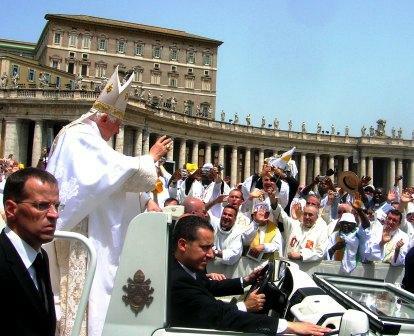 What a great sight to see — Pope Benedict blessing over 10, 000 priests in St. Peters Square in an open car after the Mass closing the Year for Priests! It was a great privilege to be part of this historic year for priests. The seminarians were seated to the left of all the priests. We got to the section first and had excellent seats. How powerful it was seeing priests file to their seats — which took hours — before the Mass began. 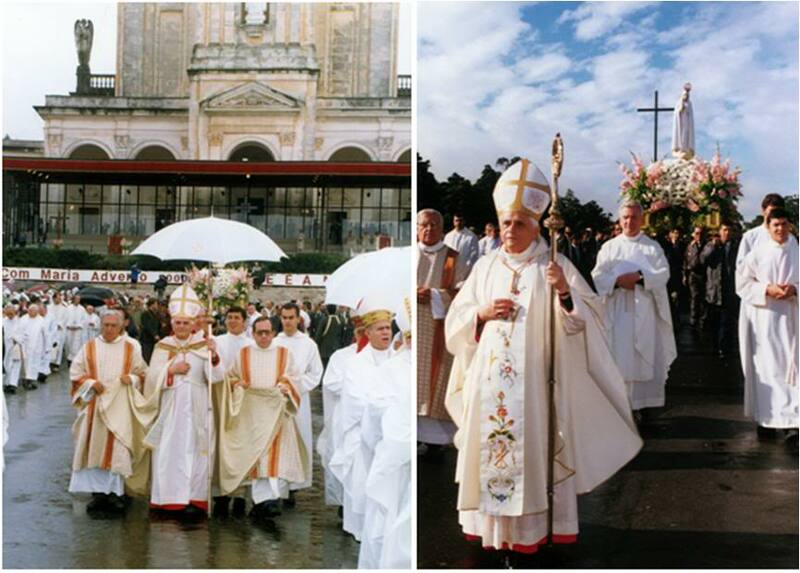 They came from all parts of the world, speaking many different languages, and their coming together to celebrate with the Pope was a witness of the unity and family of the Catholic Church. We didn’t get a translation of his homily until a few days later, so when we did, it was good to reflect again about the event of which we were a part. Today was the vigil for the end of the Year of the Priest, so we went over to St. Peter’s at about 5 pm to try to get in as close as we could to see the Pope. We were able to get in the very front of the seminarian section and to see pretty well the stand where the presentations were and, eventually, where the pope was to be. He didn’t come in until about 9:30 but there were talks starting at about 8:30 pm. The talks, I’m sure, were very good, but only a few of them were in English so I didn’t catch much of what was said. At 9:30 pm when the pope came in, he drove right by where we were standing, so I was about ten feet away from him as he drove around before approaching the altar. There, he answered questions from priests from all over the world. He answered in Italian, so again, I didn’t understand anything, but it was still really neat to have him answering these questions — and without his notes, too. After the Q & A, the Blessed Sacrament was brought in, and the pope presided over Adoration and Benediction, which was incredible! Everyone went down on their knees in St. Peter’s Square and went completely silent to receive Benediction. After Benediction ended, we got back to Fraterna Domus (late), but the sisters let us in so that we could go to bed for a few hours to get back up for the Mass the next morning. 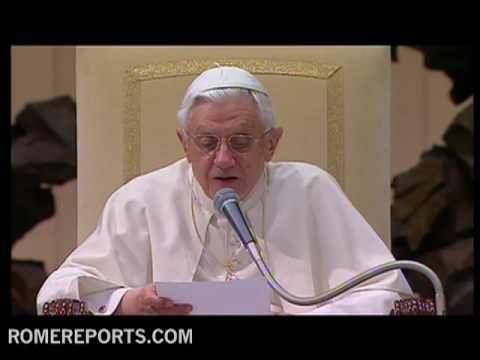 You are currently browsing the archives for the Benedict XVI category.